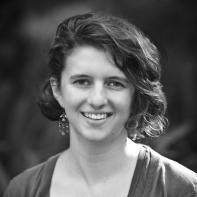 Caroline Kessler, originally from outside Baltimore, is a freelance writer and editor in San Francisco. Her prose and poetry has been published in The Susquehanna Review, Anderbo, In Bantam, Collision, and New Voices, among other places. She is an honors graduate of Carnegie Mellon University, where she studied creative writing and religion. the ocean, the you, the me, this us. of lime, these invented rituals. brushing against your slanted ceiling. at the first exhale of a breeze. into familiar shapes: mountain driftwood. where I am, rooted, searing my eyes with brightness. linger below the fog line, an abrupt mosaic. forehead, mouth in a straight line. for the Farallon Islands, twenty-five miles out to sea.